Each day at dawn and dusk the research team at Tsau! Conservancy heads out to monitor the White Lions. As the sun rises, back lighting the magnificent acacia trees on the horizon, the open Land Rover turns a corner and out from the shadows steps one of the magnificent White Lions. Looking into their clear, blue eyes for the first time is a truly unforgettable experience—and one of the highlights of spending time at the Conservancy in Timbavati, the only place on earth to which the White Lions are endemic. White Lions are currently classified under the general species classification "Panthera leo" and as such, they receive little to no protection as an endangered species. However, ongoing research that's been conducted for more than a decade by the Global White Lion Protection Trust Reintroduction Project has revealed that they are indeed a sub-speciation of this rare phenotype. If they are formally reclassified, this means potentially greater government support for the protection of these nearly extinct animals. At one point, shortly after they were first discovered in the wild, White Lions were considered to be albinos and they were removed from the bush, believed to have little to no chance of survival. However, a study conducted in 1997 confirmed that they are not, in fact, albinos. And there have been no studies to indicate that they are any more vulnerable than their tawny counterparts in terms of survival in the wild. 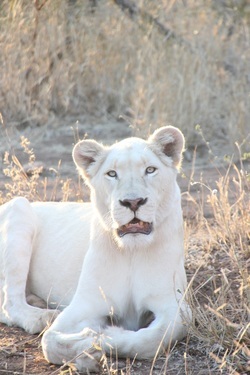 In fact, the White Lions at the Conservancy are outstanding hunters. With only very few in captivity world-wide, White Lions are exceptionally rare. They have been summarily executed through canned (or trophy) hunting farms—farms through which hunters pay vast sums of money for the opportunity to "hunt" animals in an area the size of a tennis court. While all lions fetch a hefty sum, because of their distinctiveness and rarity, White Lions are particularly valuable to these hunting farms, and as such, poaching is an ongoing reality. Also, in an effort to propagate the numbers of White Lions in captivity, inbreeding done by unscrupulous breeders has taken its toll—many of the White Lions alive today suffer from the horrific health affects of inbreeding, adding to the fragility of their existence. They have been eradicated from the wild, and 2006 was the last time white cubs were known to be born into the wild. Sadly, both cubs perished. The survival rate for any lion cubs in the wild is only approximately 20%; this survival rate is even lower for White Lion cubs. Legends of the White Lions' existence have abounded for centuries among the indigenous people of this land, and the oral records of African elders indicate that these unique animals survived in this region for many centuries. In fact, some accounts indicate that the White Lions first appeared over 400 years ago, during the reign of Queen Numbi, during a time when a meteoric event occurred in the Timbavati region. And their reappearance during recent times was prophesied (and is considered significant) by these indigenous cultures. Though the first reported sighting of a White Lion in the wild occurred in the 1930s, first photographic record of the White Lions dates to the 1970s when researcher Chris McBride recorded the existence of White Lions in more than one pride in the Timbavati region. Fearing for the safety of this unique species, McBride had the three lions captured, and subsequently moved to the Pretoria Zoo. Today, there are believed to only be an estimated 300-500 White Lions remaining world-wide, mainly in captivity.